If your struggling with dry patches and overall dry, flaky skin this winter, I've found an effective solution - Kiehl's Since 1851 Pure Vitality Skin Renewing Cream. Kiehl's Since 1851 Pure Vitality Skin Renewing Cream was created to increase skin’s resistance and recovery from damage. Kiehl's sustainably sourced the powerful New Zealand Manuka honey and Korean red ginseng root. Kiehl's is the first in skincare to combine these two powerhouse ingredients in one formula. The texture is creamy and thick, with a slight sticky/tackiness upon first contact. However, it still felt lightweight and absorbed within a minute or so. After applying the Kiehl's Since 1851 Pure Vitality Skin Renewing Cream, my skin felt very soothed and felt soft and plump with a beautiful glow. Kiehl's Since 1851 Pure Vitality Skin Renewing Cream worked well underneath my makeup on those very cold winter mornings and didn't cause my makeup to pill or smear (but note, I did wait about 2 minutes for the cream to fully absorb before applying). For those of you who have dry/combination skin like me, Kiehl's Since 1851 Pure Vitality Skin Renewing Cream worked well to deliver much needed hydration, but not clog my pores in the t-zone, or give me a greasy or oily look on my nose/forehead. I've been a big fan of Manuka Honey for the last few years and believe in the health benefits of eating it. I love now also having a skin care cream formulated with it. As for the scent, it's prominent, faintly sweet and a little spicy from the ginseng, but I loved it and it dissipated within a few minutes. Purchase Here: Kiehl's Since 1851 Pure Vitality Skin Renewing Cream 1.7 oz. I also love that you get a LOT of bang for your buck with this product. 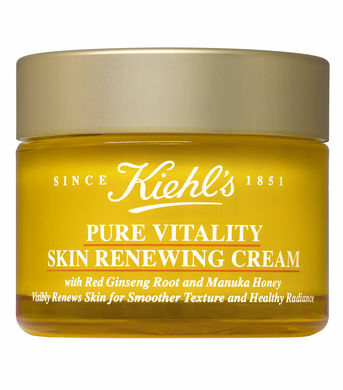 Kiehl's Since 1851 Pure Vitality Skin Renewing Cream is very concentrated. Less that a dime-sized amount is needed for even extremely dry skin. It feels so creamy one minute and seconds later it was completely melted into my skin.